Your Dentist in Richardson Is Accepting New Patients! There is no shortage of dentists in Richardson. You’re spoiled for choice when it comes to taking care of that beautiful smile of yours! However, instead of just picking the dentist that is the closest or that has cool advertisements, why not seriously consider Canyon Creek Family Dentistry for all your oral healthcare needs? You’ll discover that we can provide excellent service, compassionate care, and flexible payment options as your dentist in Richardson. It can be inconvenient to have a different dentist for everyone in your household. Instead of taking the kids to pediatric specialist that is all the way across town, stop on in and see what we can offer to your family. We’re accepting patients of all ages, so you, your little ones, your parents, and even your grandparents are all welcome to join us. We don’t want you to go anywhere else for your dental care, which is why our services cover pretty much all the bases. You can come to us every six months for basic preventive care, such as cleanings and checkups. 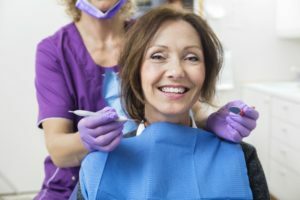 You can also rely on us when you have an oral healthcare problem that requires a bit more extensive work, like a root canal, extraction or filling. Of course, we want you to love your teeth, which is why we’re proud to offer cosmetic services as well. Whether you just want to say goodbye to stains on your pearly whites or you want a total smile transformation, we’re happy to help. Our team of three talented dentists compares their expertise with the latest in dental technology to make your experience in our office the best that it can be. Intraoral cameras make it possible for us to perform a thorough examination with you as our partner; you’ll be able to see everything the camera sees! We also use 3D Cone-Beam imaging, which goes a step beyond traditional x-rays and allows your dentist to get a full view of what is going on beneath the surface in your jaw and teeth. We know that dental care can be a bit on the expensive side, which is why we’re always willing to work with you to find a way to pay that won’t hurt your budget. We accept all insurance plans, and we’re in-network with all PPOs. We also try to save you money by taking a conservative approach to dentistry. We won’t recommend treatments that you don’t need; in fact, our goal is to get you the best results possible with the least amount of work possible. We look out for your interests, not just our own. The team at Canyon Creek Family Dentistry is eager to meet you! The doctors, hygienists, and office staff at Canyon Creek are excited to be accepting new patients! If you have questions about our practice or you think it’s time to schedule an appointment, please contact us at 972-644-3800. Comments Off on Your Dentist in Richardson Is Accepting New Patients!